Balmiki Shiksha Jojana (Non-formal Education) Is A Part Of Integrated Village Development Project (Sampurna Gram Vikash Yojana).The Aim Of The Project Is To Educate The Children Living In Rural Areas And Slums Who Are Deprived Of Basic Education. It Is A non-formal Education And emparts For Self Development. Children Are Taught Through “One Teacher One School” Norm which Enables Them To Read And Write. It operates In A Village/slum Either Under A Tree Or In Society Hall / Bhagabata Tungi (without Incurring Any Cost of The Building). Such A School In A Village Has Been Taken Up To Carry Out The Mission Where children Of All Ages Come On Their Own During Their Leisure Hours. 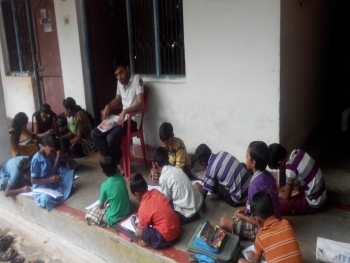 At Present 3 Centres Are In Operation In Mundasahi And Nimapur, Jagatpur Of Cuttack District. Whereas The Centre In Olatpur Is Being Run And Tought By The Students Of SVNIRTAR During Their Free Time. It Wil Be Pertinent To Mention Here That Two Labtops Have Been Provided (Free Of Cost) To The Olatpur Centre Being Donated By Rotary Club Of Nigdi-Pune And Sandvik India Pvt. Ltd.
17SUCH LABTOBS HAVE BEEN DONATED BY THEM WHICH IS BEING DISTRIBUTED TO DIFFERENT SARASWATI SHISHU VIDYA MANDIR OF THE STATE.